Fall is just around the corner, at least for us Canadians. The weather is still warm for the most part, but after the rain the other day it has cooled off quite a bit in our area. And before we know it, the leaves are going to fall and we’ll be decked out in our fall gear again. So it’s time to start thinking about your favorite fall colors. And for those who don’t know, I think fall has some of the most beautiful colors in the world. 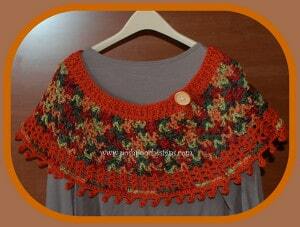 And you’ll get to see some of them in this free crochet pattern roundup. 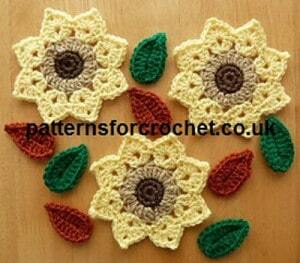 Flower Motif and Leaves by Patterns For Crochet. First up, we have these adorable flowers with leaves. 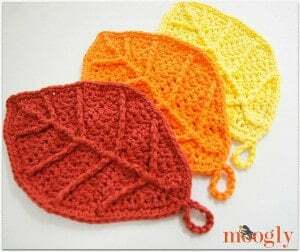 You could actually crochet these up in any bright and cheerful colors, but I love the fall combo as shown. How cute is this? And it’s so friendly and perfect for the little girls on Halloween. 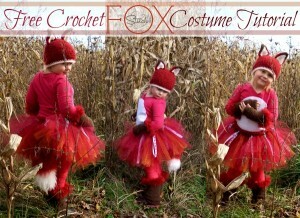 The costume comes complete with the hat, fingerless gloves, leg warmer, tutu and a cute fox tail. To access the patterns you’ll need to click out via the links provided by Stitch11. 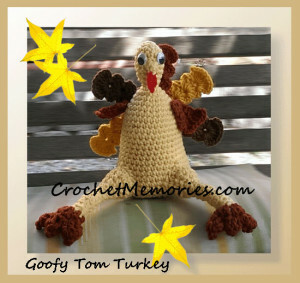 Thanksgiving Turkey by Petals to Picots. This turkey has been around for few years, but it always makes me smile. I love the cool granny squares used to create the adorable tail. I love how the leaves float on top of this hat. 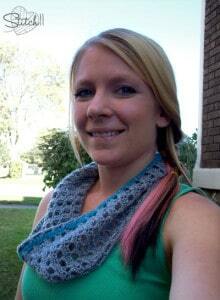 It has a nice drape, and it’ll look great with all hair types including long, short, straight or curly. And it’s a great way to get into the fall spirit. 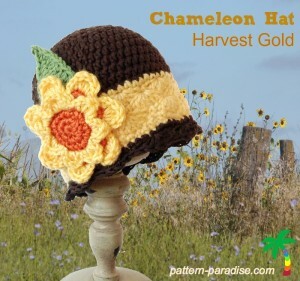 This hat is named the Chameleon Hat because of the many seasonal versions. This one is the fall version, and it’s given in all sizes making it easy for the whole family to enjoy. 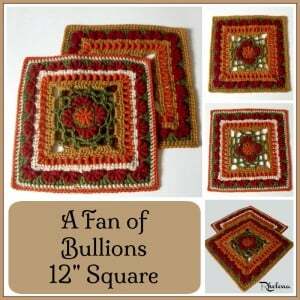 If you like the bullion stitch, then you will enjoy this afghan square. It’s got a pretty bullion flower in the center, and then along the edge we have some nice bullion fans. I used to love s’mores. The sweet smell of the melting marshmallows and the chewy texture in your mouth… oh they were so delicious. 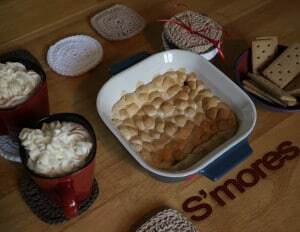 But oh those calories and all that sugar… And so to the rescue we have these adorable s’mores coasters for you to enjoy with your hot cup of cocoa, coffee or your favorite tea. When the cool fall weather starts to roll around we begin to reach for our spiced tea. It somehow warms us from the inside out. 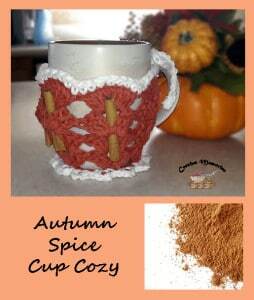 And this cozy by Crochet Memories is the perfect way to celebrate the new fall weather. This is totally gorgeous! 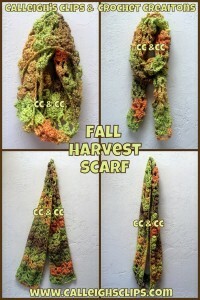 I love the stitch, and the colors are perfect for the time when you still have mostly green on the trees! The yarn that’s used is Tweed Stripes in Rainforest. 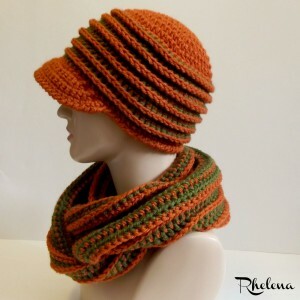 I love the wave in this gorgeous slouch. It’s pretty, and I think it would be great for both men and women. These colors are truly amazing! And so is the poncho. It’s a great alternative to a jacket, and enough to keep your shoulders and back cozy while going out in cold weather. This cute motif measures 7″ across the points. It makes for a pretty doily or for a large coaster at the table. 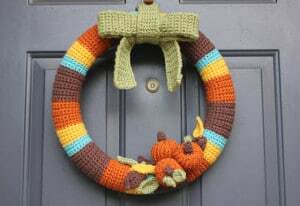 I love the simplicity, yet the gorgeous look of this fall wreath. And best of all, it can be used year after year. 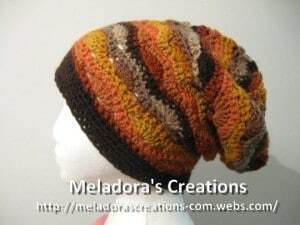 This is crocheted in pretty fall stripes, but you could use any of your favorite colors to make it. It’s pretty, but there’s lots of ends to weave in on this one. These fall leaves measure 9 by 5.75 inches. They make for cool coasters at the table, or use them as a doily or as a washcloth. 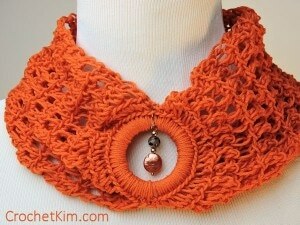 You can certainly crochet this in any color that you like, but the bright orange makes it fitting for the fall season. 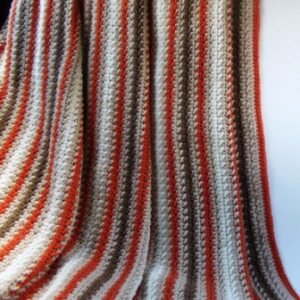 Plus it’s a smaller cowl, which is perfect for the not-so-cold weather. 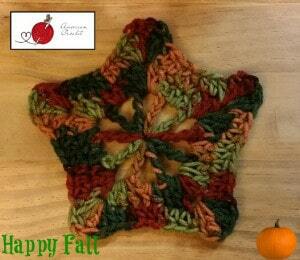 Here is another cowl pattern that is perfect for the fall season. 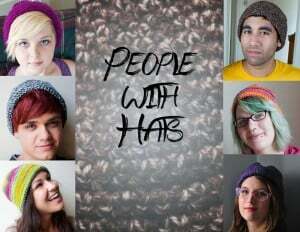 It’s not crocheted in fall colors, but you are the artist and can choose any color you like. The stitches are light, so you don’t have to worry about being too warm. 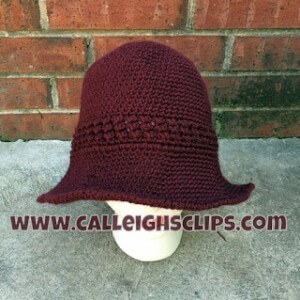 The Aubreigh Hat is another nice pattern to help you transition into the cold weather. It’s got a nice brim to keep the sun out, but it also looks like it’ll do a nice job at keeping the ears warm as well. 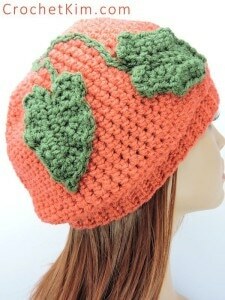 And yet another cool hat to keep you stylin’ as the weather cools off. This one is perfect for the men and women. And as you can see, it looks fabulous regardless of the colors you choose. 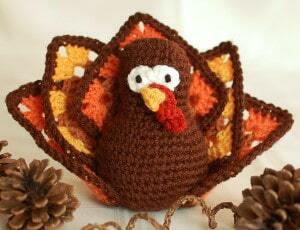 You can’t have Thanksgiving without this adorable turkey amigurumi. He’s great as a toy, or as a cute decoration. This hat and cowl set is crocheted in fall colors, but the coziness of the design is also very fitting for the extreme cold in the winter. Thanks so much! 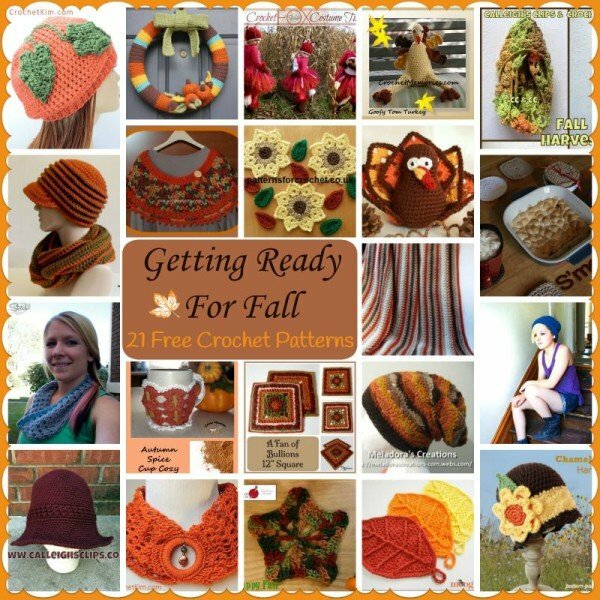 I hope you enjoyed this round up of free fall crochet patterns. And if you enjoyed these, you might also enjoy the growing collection over at CPB: FREE Fall Crochet Patterns.